Turn your smartphone or mobile device into a powerful gaming machine with the Bnext VR Headset! The Bnext VR HEADSET is a truly remarkable video game system. By inserting a compatible smartphone securely into the front face piece, you can play games in a total 360-degree world where the only limit is your imagination. Better yet, you can ride on virtual rollercoasters, watch VR YouTube videos and experience thrilling scares like never before. If you're ready to envelope yourself in a whole new world, pick up the Bnext Virtual Reality Headset and experience games and videos in a whole new way. Click 'Add to Cart' now and start preparing for the VR gaming revolution with your very own portable VR Headset Virtual Reality Glasses! PERFECT GIFT FOR KIDS & ADULTS - Your family and your friends will be so happy to get this special tech Christmas gift . 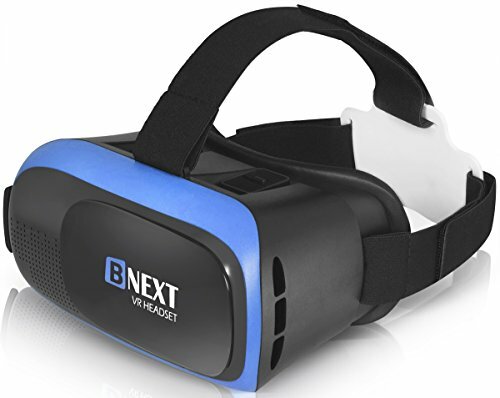 Bnext VR Goggles works with smartphones and mobile devices like iPhone X/8/7/6/5/PLUS Samsung Galaxy S5/S6/S7/S8/note 4/note 5/edge Google Pixel & more 4 - 6 inch smartphones like Motorola/Moto G5/G4 LG g6/g5/g4/v20/v10 Huawei HTC Nexus Xperia Xiaomi & more. ADVANCED VR GAMING TECHNOLOGY - Gaming and watching movies in VR works best when your eyes properly align with the screen. That's why our VR headset comes with bigger lenses & offers FD and OD adjustments (wide FOV) to expand the viewing angle and perfectly match focal distance and unilateral myopic alignment for reduced distortion. COMFORTABLE, EXTENDED WEAR DESIGN - Once you start gaming and watching VR movies with Bnext, you are never going to want to take it off. That Is why we offer a comfort-fit experience with a fully adjustable head strap, eyesight protection system, and a soft nose piece to reduce pressure. Bnext VR for iphone (virtual reality headset for iphone & android) also works great with drones. PLAY AT HOME OR ON THE GO - The best thing about our VR headset is your ability to play virtual reality games wherever you may go. Unlike some headsets, the Bnext VR headset gives you complete access to headphone jacks and other peripherals so you never have to stop gaming until you're ready. EXCLUSIVE VR CONTENT & ONLINE SUPPORT BY B&A TECHNOLOGIES - Along with the more than 300 games, google cardboard vr adventures to be found on the Apple App Store and Google Play Store, we also provide a QR code with special VR content! Enjoy your new Bnext vr Headset.